To see more of this seller's radios, visit Exceptional Radios LLC. Mirrored radios enjoyed a vogue in the 1930s. 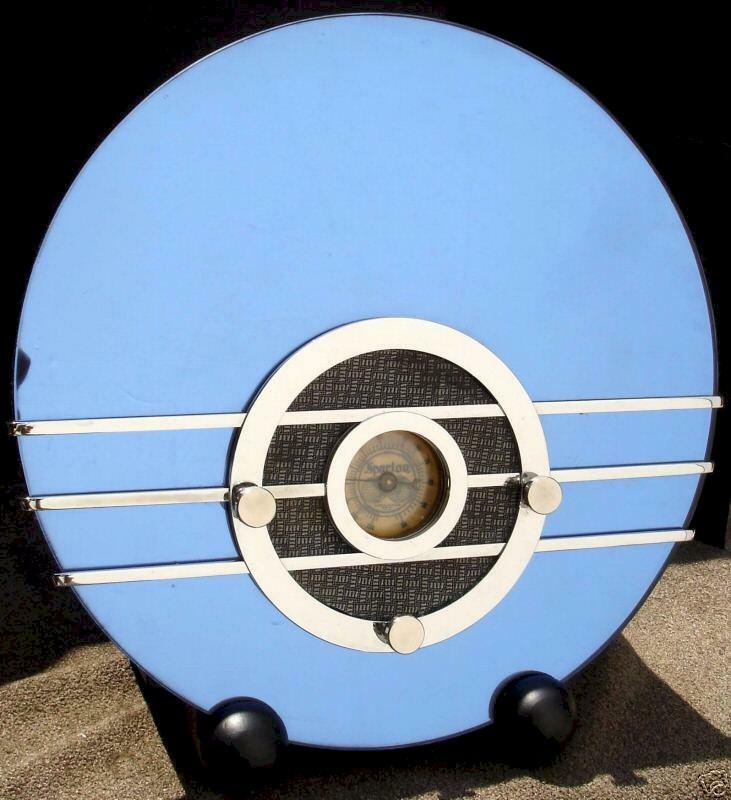 The Bluebird was created by Walter Dorwin Teague, one of the most celebrated industrial designers of his time. This is one of the most recognizable and desirable of all antique radios. The cobalt blue mirror that is the front panel is 14" in diameter, 1/4" thick, and quite heavy; it is backed with a layer of dark felt. Chromed trim strips fit through small openings in the circular dial bezel. A circle of metal mesh surrounds the dial, giving the appearance of a grille (the true grille is on top of the cabinet). The dial itself is tiny and quite beautiful, marked in blue with a graceful blue. I never attempted the radio repair. The mirror has been professionally re-silvered and felt backed. The chrome trim has been perfectly re-plated and the case repainted. All original parts except new rubber feet; the speaker cloth was replaced with a very good reproduction. The set was rather aged when I got it, as expected with a 70+year old radio. You are visitor number 4,511 to this page.